Is it still Government policy to issue smog alerts for London? I sent you an email on Sunday 5 April but am not sure whether you received it so I am resending it as this letter. 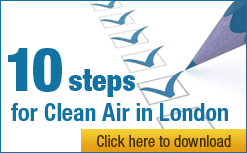 I am writing on behalf of the Campaign for Clean Air in London (CCAL) to ask you to confirm please whether it is still the government’s policy to issue public warnings of significant smog events (i.e. not just those required to be made by law). Perhaps, if the government does not plan to continue this practice, it might ‘direct’ the Mayor of London to take over responsibility for issuing these warnings to protect public health in London. Clear lines of responsibility would clearly need to be drawn in the latter case. As far as CCAL is aware, the government did not issue a public smog warning before Bonfire night in 2008 or in the week commencing 30 March 2009 week in respect of one of the first summer smogs of 2009. CCAL’s considers the lack of such warnings to be surprising – not least when the former was issued in 2006 and 2007 and the latter in 2006, 2007 and 2008. To give you a measure of the severity of the smog in the week commencing 30 March 2009 in London (which coincided with the G20 meetings in London), I received a CERC airTEXT alert on the evening of Thursday 2 April forecasting ‘high air pollution everywhere in City of Westminster’ – I do not recollect ever before receiving such a severe warning (even in the high summer). By coincidence, Bonfire night last year was just a few days after the deadline for the UK to submit a time extension notification to the European Commission for breaching laws for dangerous airborne particles and the current smog is just a few days after the deadline in the Letter for Formal Notice for breaching the same laws. You may be aware that CCAL has suggested that the categories for Air Quality Measurement and Forecasting should be updated. The current banding has been in place for many years and is out of ‘sync’ with World Health Organisation maximum recommended limits and the European Union Limit Values. This means, for example, that air pollution could be ‘Low’ all year round and still breach EU Limit Values. This is a confusing message for the general public. I have attached below links to the previous warnings and have copied the Mayor of London in the hope that he will issue smog warnings in future if the government does not do so.